Successfully Added Mini Digital Video Camera with Encryption Feature to your Shopping Cart. 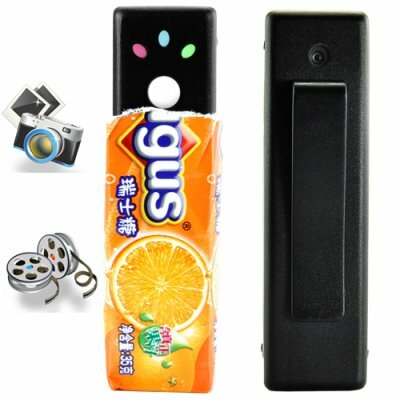 New version of our popular mini video camera - chewing gum wrapper sized edition. This mini digital video camera is the ultimate tool for conveniently recording video and audio. Be portable and have a good battery life. Record audio and video and have enough storage capacity for hours of media. Be well constructed and not be flimsy or feel like it's going to fall apart. Be easy to conceal and in cases where the camera is worn on the body, it should attach securely. This pocket mini digital video camera brings together these qualities into a tiny form factor and delivers it at a great price. It will give you over 2 hours of continuous recording afterwhich simply connect it to your PC, laptop, notebook, or netbook USB port to recharge. It records video and audio and even comes with a free 2 GB microSD card! Pick it up, it feels solid, well-made from durable high density plastic. At first glance, you might mistake this device for a cigarette lighter. It's actually smaller than your average disposal lighter. On closer inspection you'll notice that it has a wide clip which allows you to attach it to your shirt or trouser pocket. It also has three buttons. One button locks and unlocks the unit. Another button toggles between taking snap shots and continuous video. The third button does everything else. One button operation. Press it to turn the unit on. Press it again to start recording or take a photo. Press it again to stop recording. Press it again to turn it off. That's pretty well it. Simple + Useful + Powerful - and that's not all! For what's the purpose of secretly recording video and audio if anyone can come along to view those files? The answer to that question is that this particular model has a file encryption feature. Included with the CVHE-I11 is special software which lets you view the files created with this camera, but more importantly it allows you to password encrypt the videos. If the files should fall in the wrong hands, they can only be viewed by entering the correct password. Beautiful right? But wait! Aside from using this device as a camera have you ever thought about the possibility of capturing your entire life on video? Think about it. Wouldn't it be cool to have a complete archive of every minute of every day of your entire life? That way you could go back at any time and listen to a conversation you had or relive a treasured moment. Now you can with this remarkable life recording device brought to you by the leader in direct from China wholesale electronics - Chinavasion. It used to be that this dream was impossible because memory was too expensive. No longer. Your average 500 GB hard disk drive sells for roughly 100 dollars. That's 1 dollar per GB of memory! Another obstacle used to be the unavailability of video capture devices which were portable and would not obtrude in your daily activities. No longer with the CVHE-I11. Think about it. Walk around with this device attached to your shirt. Wherever you go, whatever you do, whoever you meet, whatever you talk about: it all gets put on video. With sound too! And you'll be able to fit 15 hours of video memory on a single microSD card. At the end of the day, easily transfer all the files onto your hard drive and voila! A complete video archive of your life. What about battery power? This unit will continuously record for over 2 hours on a single charge. When you run out of power, plug it into any USB drive to charge. Better yet, buy 2 or 3 units so you'll have complete coverage for your entire waking day! Comes with special software to play videos created with this camera. The MJP video format is propriety and facilitates encryption. You suggested that this device could be used to record all the moments in your life. My computer hard drive isn't big enough to store all that. Does Chinavasion sell external hard drives? We certainly do. Consider the Portable 500GB External HDD for Mobile Storage Solutions, model number CVIG-E29 as the perfect solution to retain your life memories. Can you really get 2.5 hours of continuous video on a single charge? When we first tested this product we were concerned about the claim as well. So we tested it by fully charging it and walking around the office capturing continuous video. We are happy to report that based on our tests, the unit ran for 2 hours and 41 minutes on a single charge. During that time, 331 MB of video were shot amounting to barely one sixth the capacity of the 2 GB microSD card included free of charge. Amazing!